When the ship sailed at the middle of December (picture, right - click for larger version so you can see the ship in the far distance) it was with heavy hearts that we said, “good-bye” to dear friends and to the only reliable medical care we knew of in this country. At the time of sailing, there was a patient, named Koliwo, that was left behind at Island Pediatric Hospital. 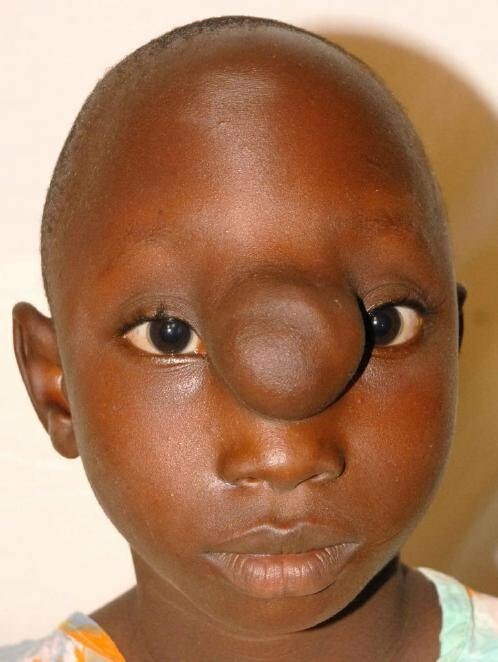 He and his father had traveled from a remote village in Guinea last October to seek surgical repair of a Frontal Encephalocele. After surgery, he had complications and was unable to return to his home. He was going to need a VP Shunt placed in his brain and Dr. Gary Parker asked if I would be willing to assist in the administrative task of making sure this happened. A Neurosurgeon from Alaska, Dr. Estrada Bernard, was going to be coming home to Liberia for his parents' wedding anniversary between Christmas and New Years and he had agreed to see some patients at the local JFK Hospital. He is the nephew to the President of Liberia and is a very skilled, kind, and humble man. Before Dr. Bernard's arrival, Koliwo seemed to be healing and we didn’t think he’d need any further interventions . . . but we were very wrong. He started having fevers and vomiting and it was determined that he had an infection in his Cerebral Spinal Fluid and was going to need antibiotics and then a VP Shunt placed – but Dr. Bernard would be gone by the time it was safe for the surgery. After many hours of discussion, emails, prayers, and phone calls, it was arranged for Koliwo to fly to the Kijabe Hospital in Kenya where he was able to have the VP Shunt placed. It was a fight to the finish and many miracles took place along the way enabling Koliwo to make it to Kenya. We even had to get a letter from the President of Liberia saying that he would be allowed to return to Liberia as the Kenyan Government wouldn’t allow them entry without guarantee that they could return to Liberia. The President of Guinea had died and there was military unrest in Guinea and there was concern that they’d be “stuck” in Kenya. Koliwo stole our hearts and we were so grateful that we were here in Liberia to help facilitate in saving the life of this child – it was a great team of people working together to make it happen. Koliwo returned to his Muslim village healed and with an amazing testimony of God’s grace and faithfulness in his life!